There is a LowRes Jam competion, which is such as create a game using a 64x64 resolution. Im thinks its a fun resolution to work with and did a little retro remake (im still adding more levels). 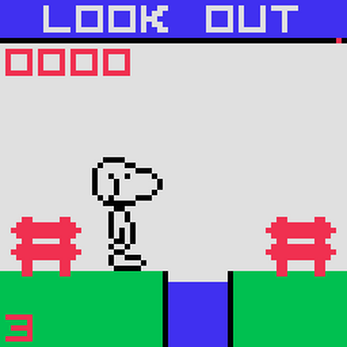 As a kid im liked the Commodore 64 game "Snoopy". Yes, the Commodore 64 game was quite very basic, but im still liked the little game as its was. 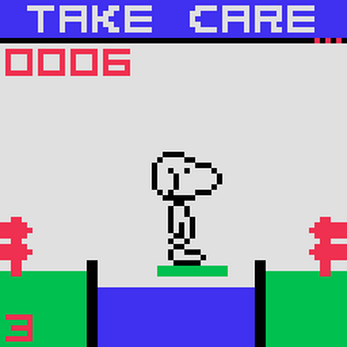 So im dedicated to doing a remake (or a demake) using Fairchild Channel F style palette (but im have not line limited strictly to its limits as im did with CatchOut) and in of course in 64x64 resolution (due the Lowres Jam). Yes im still using glbasic, due im have not checked out Unity yet, but im also reused very much from the CatchOut project. This why im could done so much in few days (include music). PS. Currectly there is 20 levels, both inspirated from the original game, and some my own, and this is just a fun little project. A new game...always good. However, it's frustrating how everything seems to kill you so fast - it's quite hard really. I do like the extreme low-res though. im will add a start screen, where you select the start level. The original game can also been a quite hard. Im will update it after the vote is over. ALso im will start with 5 lives rather than 3. Also scoring is will been removed if you dont start from level 1. Yes 64x64 pixels was a fun resolution. v1.2 is uploaded. should now been a bit easier and more fun.